2001's Sing Along with Los Straitjackets was the first time the masked instrumental musicians let vocals appear on their tracks, an endeavor they would embark on again later with Deke Dickerson. 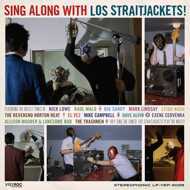 Sing Along with Los Straitjackets features a party of musicians spanning all across the musical sphere, from Nick Lowe playing bass on his own "Shake That Rat," to collaborations with Exene Cervenka, Mark Lindsay, The Trashmen, Tom Petty and the Heartbreakers' Mike Campbell, and even more. Being reissued on LP for the first time ever for Record Store Day Black Friday 2017, every Record Store Day Black Friday issue of the LP also comes with a bonus 45 single featuring two never before heard collaborations from the Sing Along with? sessions featuring Dave Alvin and Reverend Horton Heat (who also make an appearance on the album! ).